Kaylee exploring the striped sandstone formations of the Fire Wave in Valley of Fire State Park. About an hour from Las Vegas is a state park that might just outshine the strip. 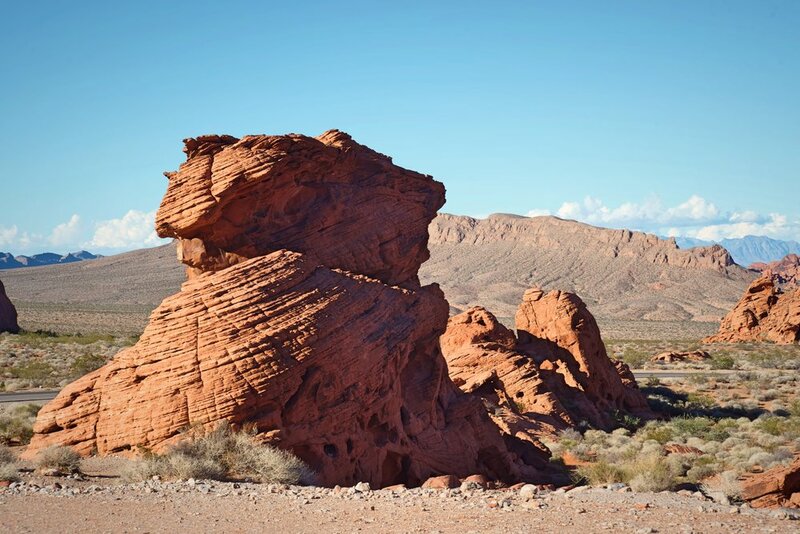 Valley of Fire State Park takes its name from the red striated sandstone formations found throughout the park. There are tons of great hikes throughout the park, but there are also many things that are just off the park’s two roads. There are two paid campgrounds inside the park, but for those willing to rough it a bit there is free camping on either side the park on BLM land. We drove into the park from the west, and as soon as you enter the park, you see the Beehives. The Beehives are beautiful conical layered sand stone formations. There is no marked trail around the Beehives, but you can easily explore around the bases of these formations. A very beehive looking Beehive. Just beyond the Beehives, there is a short trail that leads to some petrified logs. About 225 million years ago trees from an ancient forest washed into the valley. Since then the logs have been infiltrated by minerals and fossilized. We aren’t going to lie, this is not the most exciting thing in the park, but you might appreciate it if you’re a rock hound. Yep. That’s a log that’s also a rock. We saw tons of lizards while we were walking around. We also saw lots of birds and two bighorn sheep. Just across the road from the petrified logs is the Scenic Loop Road. Along this road is the Atlatl Rock and the Arch Rock. The Atlatl Rock has ancient Indian petroglyphs chipped into the darkened sandstone about 30 feet above the ground. Stairs lead to a small platform where you can get a close-up look at the rock art. The rock is named after the “atlatl” that is pictured on the rock, a predecessor to the bow and arrow that was utilized to throw spears. Besides the atlatl there are animals, humans, and other symbols depicted. The other “major attraction” on the scenic loop is the Arch Rock. In pictures, you’d be led to believe that this arch rivals the arches of Arches National Park. Nope. It’s pretty underwhelming at about three feet tall. But it’s still a cute little arch. The cutest little arch around. White Domes Road, also known as Mouse’s Tank Road, leads to most of the trails in the park. It’s a beautiful road to drive on it’s own, because it goes through a beautiful red sandstone valley that is popular for photos. 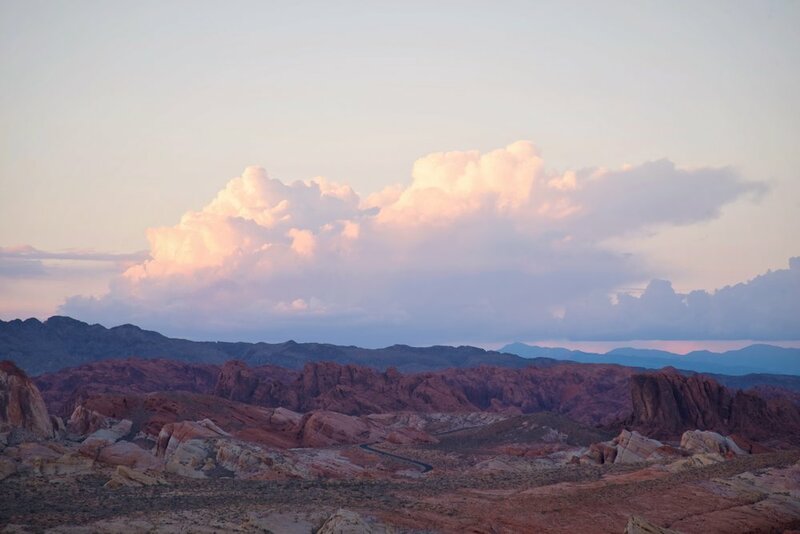 Be sure to stop at Rainbow Vista, which overlooks the colorful sandstone of the park. It’s a great place to watch the sunset, and we saw two desert bighorn sheep while we were there. Fire Canyon Road is just a short spur from White Domes Road. It leads to Silica Dome, a sandstone formation of pure white silica that has no iron in it and that has not been turned red by oxidation. However surrounding Silica Dome is the park’s signature red sandstone, and it makes a beautiful contrast. Enjoying the panoramic view of Silica Dome at the end of Fire Canyon Road. The Fire Wave hike takes about an hour and there is no shade. Fortunately it was cool while we were there in late October. The trail starts beneath large sandstone cliffs. At the end of this formation is a large blocky rock called the Gibraltar Rock. Beyond the cliffs, we arrived at the slick rock, which starts to gain white and orange stripes as you approach the Fire Wave. We were really impressed by the yellow sandstone that is also scattered through out the park. Ian by the bowl of the Fire Wave. When you arrive at the Wave you are looking down on it. As you descend the curves in the stripes of the sandstone bowl become more and more visible. Beyond the wave there is a small wash. We crossed this and found that there are striped sandstone formations on the other side as well. Make sure to check out the striped sandstone just beyond the Fire Wave as well! The night before we arrived in the park, we experienced a massive desert storm. I woke up to thunder rumbles, and I watched dry purple lighting crack across the sky for about an hour before the rain hit us. Somehow Ian managed to sleep through all that. But once the rain and hail hit the metal roof, it was so loud and forceful that even Ian couldn’t sleep through it. Fortunately we were in very high area without any risk of flash flooding. There was a great deal of debris and gravel over some of the roads in the park though, and the rain affected some of the trails as well. At the same time, it felt like everything in the park had been cleaned and the plants were brighter and greener. Seeing puddles in the desert is a bizarre and unique experience. We wanted to do a trail run in the park, and we decided to try and run White Domes Trail. The trail began in deep sand, the next part was a scramble that was pretty much impossible to run, and the slot canyon along the trail was completely filled with foot deep water. The colorful sandstone outcrops on the White Domes Trail. Stone stairs on the White Domes trail. The colorful White Domes were very beautiful though, and the shapes they formed were incredible. The slot canyon would have been really neat as well because it was so narrow. We probably would have gone through the water if we weren’t trying to do the hike as a run. We finished the run by approaching the loop and accessing the slot canyon from the other direction and running on the road a bit as well. Aside from it being so hot, it eventually turned out to be a good run. Mouse’s Tank Trail was our favorite place to hike in the park. The trail goes along a wash that was very muddy when we hiked it. Be sure to look at the blackened sandstone walls along the hike, because they are completely covered with petroglyphs. There is an even greater variety of symbols than at Atlatl Rock. There were deer, lizards, sheep, and snakes. There were people, people dancing, people with horns, and handprints. There were other symbols of suns, medicine, plants, spirits, and some indicating whether there was water nearby. Nobody knows exactly what the symbols mean, but anthropologists have some guesses. There is a reason that the hike is also called “Petroglyph Canyon.” Hundreds of petroglyphs line the walls. The sandstone formations of Petroglyph Canyon reflected in a puddle. Mud sculpted by the previous night’s storm. Mouse’s Tank is a natural sandstone “tank” of water at the end of the trail that hold water for months. Since it had rained the night before and there were puddles everywhere, the tank itself wasn’t all that impressive. However, we turned right at the end of the canyon and continued scrambling a little bit further up a branch on the canyon, taking in some of really incredible nooks and crannies that have been carved into the rock by wind and water over the years. We enjoyed exploring all the nooks and crannies in the sandstone beyond Mouse’s Tank. Hiking up the sandy wash in Petroglyph Canyon. All the plants seemed greener because of the storm. Ian scrambling in the canyon beyond Mouse’s Tank. We found several more small arches that were definitely more impressive than the arch on the Scenic Loop. 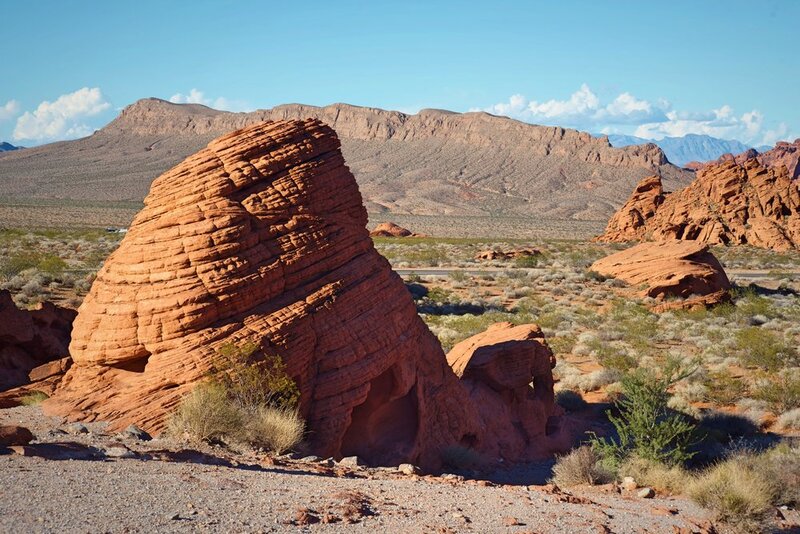 Free camping nearby: One of the great parts about Valley of Fire is that there is free camping right outside the park on both the west and east sides. On the East side of the park, there is another BLM site. We arrived in the dark, but when we were able to access it the next morning we saw that we were on the top edge of a large gorge, and that it was a really lovely site.